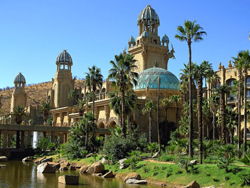 This package provides an unbelievable experience of one of the most famous resorts in the world, Sun City Resort and Casinos. 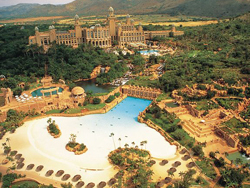 The Resort offers guests unrivalled entertainment and luxury, as it boasts four world-class hotels, casinos, two golf courses, theatres with live shows, a variety of superb restaurants, a night club and of course the opportunity of enjoying the magnificent water theme park known as the "Valley of the Waves". Depart Johannesburg at 11:00 am and arrive at the Hotel at 2:00 pm. Guests can then spend some leisure time exploring the Resort. Enjoy breakfast at the Hotel and spend the rest of the afternoon at leisure exploring the many entertainment options available at the Resort. Guests may opt to take a guided tour of the Resort, or spend some time shopping, or gambling at one of the casinos, or spend the afternoon sun bathing and catching a wave at the water theme park, the "Valley of the Waves". Complete the evening by catching a live theatre show or dinner at one of the many mouth watering restaurants found within the Resort. Breakfast is served before we depart back to Johannesburg at approximately 10:30 am. Rates based on a minimum of two guests.